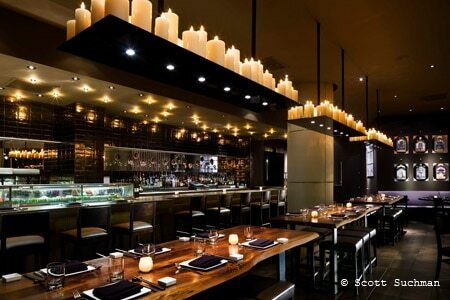 Sleek, modern sushi and pan-Asian eatery in Logan Circle. : This elegant, upscale pan-Asian eatery offers sushi and cross-cultural entrées that snag flavors from Cantonese and Singaporean kitchens and elsewhere. Located in The Donovan, A Kimpton Hotel, at the edge of Thompson Circle and open only for dinner, it has captured the after-work and late-night partiers who appreciate the sushi bar for eats and drinks. The menu also features a delicate Singapore slaw, a pulled-duck roll sparked with nuts and goat cheese, Mongolian rack of lamb, and caramelized black cod, among so many other dishes that it would take a stalwart gastronome to eat his way through it in its entirety. It’s a bit pricey, but the Asian fare coupled with unusual cocktails and high-class sakés make this a memorable, if celebratory, experience. Note that hotel guests may enjoy select menu items poolside on the roof.